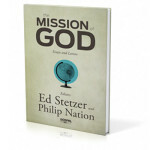 Download The Mission of God eBook! The newest Adult and Student Gospel Project study is titled The God Who Sends. In conjunction with this new study we are excited to provide this free eBook as an additional resource. The Gospel Project has partnered with B&H Publishers to offer a free eBook titled The Mission of God with essays and letters from pastors and church leaders such as Ed Stetzer, Philip Nation, Matt Chandler, Wendy Alsup, Juan Sanchez, Ray Chang, Eric Mason, David Hesselgrave, Andreas Köstenberger, Andrea Mullins, Trevin Wax, Adrian Warnock, Billy Graham, Tullian Tchividjian, Afshin Ziafat, J. D. Greear, Christopher Wright, Eric Geiger, Erwin W. Lutzer, Jack Hayford , R. T. Kendall, Linda Bergquist, R. C. Sproul and many more. The mission of God is one of the great themes throughout the Scriptures. As God reveals Himself throughout history, it is He who reaches out to us. God’s mission among us is to glorify Himself through the work of redeeming people and restoring creation. By God’s mission and God’s mission alone can we come back into fellowship with Him. Our desire is that you will be a part of God’s great plan so that men, women, and children from every tongue, tribe, and nation will believe the message of the gospel as it comes to them through the proclamation and life of the church.